We get to LIVE here!!! I’m sitting on the porch of our guest cabin this morning in my pajamas marveling and how lucky we are to live here in this beautiful place. I have to pinch myself! Lots of progress is being made on our new home. We have a lovely new footing and frost wall in place and after waiting for several days to make sure that it’s cured, we are back-filling it now with rocks, sand, crushed rock (to come) and compacting it. Yesterday and today, the back-filling has been happening. If I understand correctly, there will also be some flooding which will push all the sand into places where it’s not going. We want the foundation of our slab to be completely stable so this part of the process is critical. 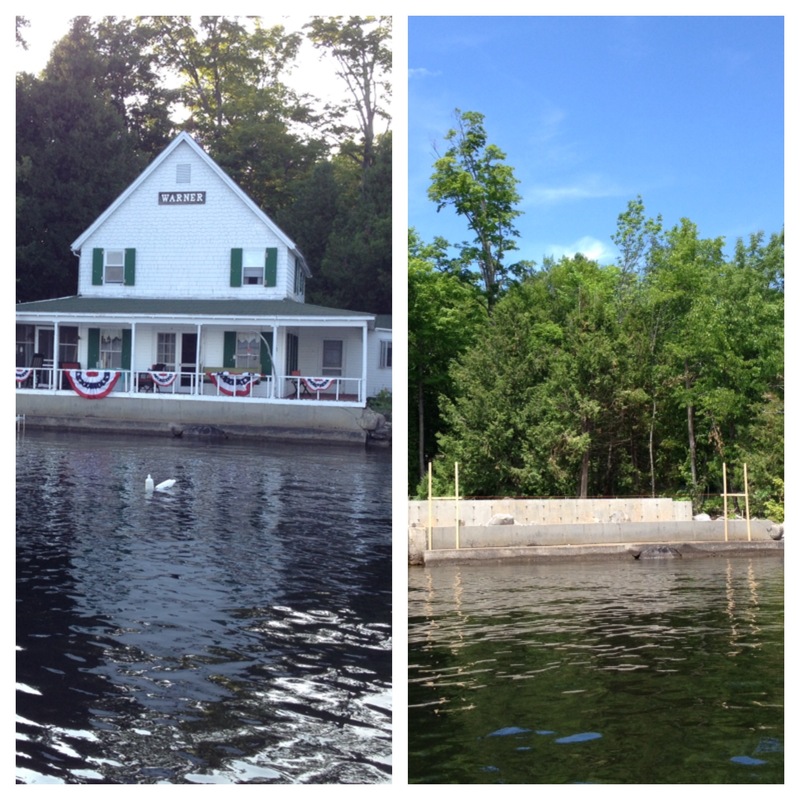 Ned and I took a little ride in our canoe on Sunday to get out on the water and to see our house from the lake. While the angle of my photo isn’t the best, the progress is, at least, visible now. But there is still a huge hole where the old house sat. Coming home in the canoe, there’s no big white house to use as a point of reference. It’s still a little bit sad. While we were out on the lake we also met some new neighbors, Janna and Peter, who moved here from New York after being “summer people”, too. 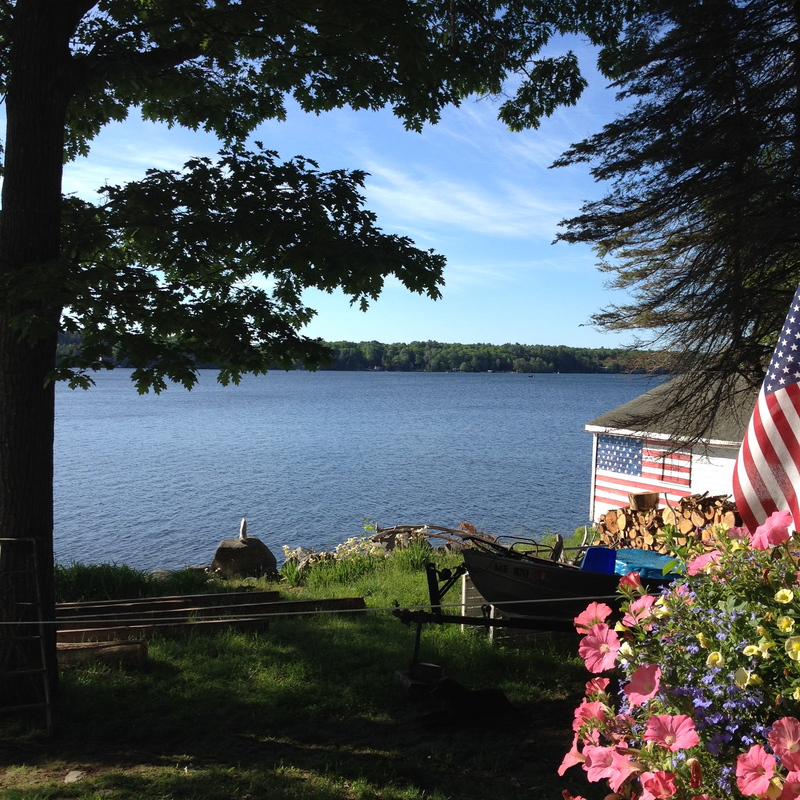 It’s wonderful to listen to the stories of others and see them flourishing here on our lake. It’s in reflecting on their success that I (we?) can also see that we are building a wonderful life here and we are excited about our future. I know we are simply astonished each day when we open our eyes and see our magnificent view and wonder that we get to live here. What a privilege. We are so blessed. This entry was posted in Uncategorized and tagged a special place, back-filling, fishing cottage, fishing cottage lake house, footers, foundation, frost wall, Guest House, Living in Maine, Maine, Mainers, Messalonskee, Messalonskee Chronicles, progress, we get to live here, We live in Maine on June 17, 2015 by lindarockwell3.